We don't really like to swear on this site. By and large PCWorld is a family-friendly affair. 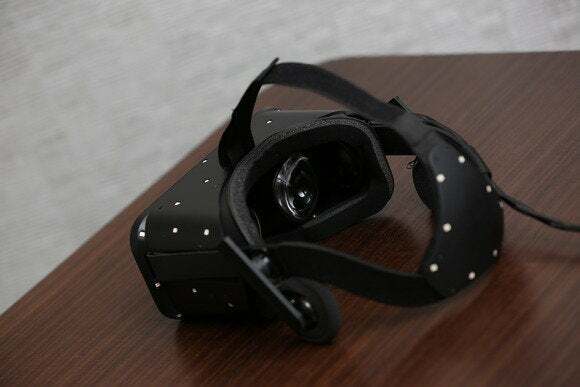 Which is a shame, because at Oculus Connect on Saturday I got hands-on time with Crescent Bay, the latest internal Oculus Rift prototype and most likely the last stepping stone before the consumer Rift. And all I can say is [redacted], it's amazing. [Redacted]. In case you missed the announcement Saturday morning, here's a quick rundown of what Crescent Bay entails. It's not a new development kit. You'll never be able to buy it. Instead, like the Crystal Cove model demoed by Oculus at CES earlier this year it's an internal prototype—a benchmark of what the company is aiming for. According to Oculus CEO Brendan Iribe's keynote, the step from the newly-released DK2 to Crescent Bay is as big as the step between the first-gen (DK1) and second-gen (DK2) developer's kit models. If you've used the DK1 and DK2 you know what an incredible difference that is. If you haven't, imagine the only television set you've used your entire life is a grainy old 70s CRT and then somebody played you a movie in full HD for the first time. Crescent Bay increases the resolution yet again (rumors say it's probably the 1440p screen used in the Note 4, though Oculus was for some reason hesitant to let me crack open one of their few Crescent Bay models just to look at the screen). Along with the higher resolution you get a higher refresh rate, which should again decrease the amount of judder (and thus your likelihood to get motion-sick). The Oculus Rift Crescent Bay prototype. You'll also notice some cosmetic differences—namely, that there are now white dots all over the outside again including the back of the headband and that two tiny headphones hang down from the sides. Crescent Bay features full positional tracking, even from behind, and integrated 3D audio. The key word for Crescent Bay is "presence." Iribe said it about a dozen times during his keynote and then another dozen times during a behind-closed-doors speech to press. By that, he means forgetting that you're staring at a virtual world. Iribe claims this is the point—this is where VR becomes a real thing. But that's all marketing speak. What's it actually like? Like every iteration thus far, Crescent Bay comes with a brand new demo to show off its capabilities. A set of demos, really. In the ten or so minutes that I wore Crescent Bay, I think I saw eight or nine distinct demos, each designed to show off a certain aspect of the unit. Oh, and big news: You stand. 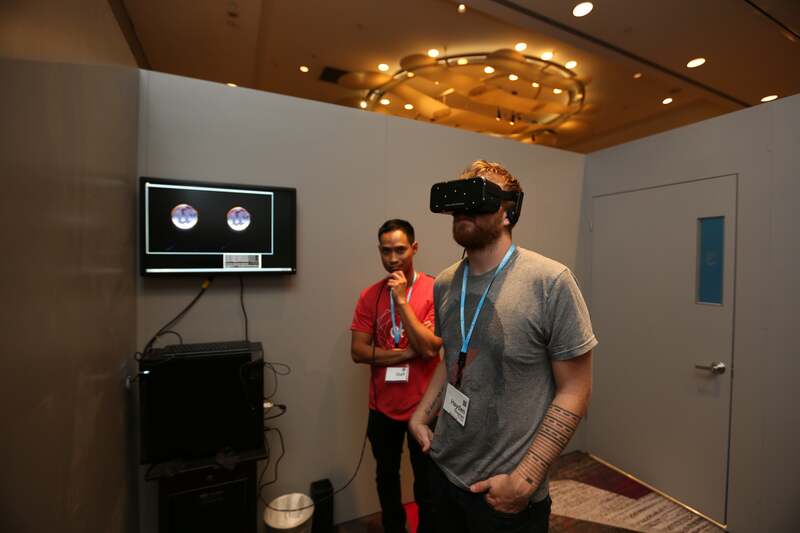 Oculus has been notoriously reticent about standing while using the Rift. John Carmack's keynote during Connect even featured him speaking at length about "Swivel Chair VR" because the company views standing use as a liability. Except, apparently, when it comes to the Crescent Bay demo. Author Hayden Dingman settling into the Oculus Rift Crescent Bay demo at Oculus Connect. I was brought into a small cubicle with a grey mat on the ground and told I could walk, crawl, whatever on the gray mat, but would be stopped from leaving the mat with the headset on. The Rift was placed over my head, the hanging headphones adjusted onto my ears, and we were off. The first demo was fairly rote. The Rift turned on and I found myself standing in a beautifully rendered but empty corridor, all industrial steel and green lighting. It was clear that the resolution has gone up since the DK2, though you can still see individual pixels if you try. And I tried, especially because I was just standing in this boring green room. Still, I walked around a bit, looked at some gauges. The position tracking worked, even when I turned fully around. Let me say that again: I reflexively waved at a virtual alien. I then loaded (to the best of my memory) into a dark room with a raptor, which roared at me, and then into a cartoonish, flat-shaded scene on a beach. There was a small campfire, a moose, and a fox. Again, I kind of just looked around, walked a bit. Walking is harder with the Rift than you might expect—even when you know there are no obstacles to trip over, it's still hard to convince your brain to just walk like a normal human. ...And I was standing on the edge of a skyscraper, traffic passing miles below. A zeppelin floated above, next to an Oculus-branded skyscraper. There was a bridge off to the side. It took me a bit to realize all of this, because I was too busy looking down. Had somebody turned on a fan at that moment I might have yelled—for a brief moment Iribe's "presence" marketing crap was a real thing. I honestly believed I was on a ledge. Not consciously, of course. Your brain's not dumb. It knows you're standing in a room in a hotel in Los Angeles, wearing a goofy-looking headset. Hell, you're all-too-aware of the iconic "I'm wearing a Rift and my forehead is slightly sweaty" feeling. But on a different level it didn't matter. I was on that ledge. The rear of the Oculus Rift Crescent Bay headstrap is adorned with LEDs to enable full 360-degree positional head tracking. In one, you're standing on a barren, rocky planet as an expertly-rendered alien talks to you in an unfamiliar language, occasionally yelling at you or smiling. And then the alien raised up a hand and waved. Before I really understood what I was doing, I'd already raised my own hand reflexively. Let me say that again: I waved at a virtual alien. Then there's the Showdown demo, which closed out our time with Crescent Bay. Showdown was designed by Epic, and features a battle between a group of soldiers and a massive robot. The camera moves inexorably down the street towards the robot while the action progresses around you in slow motion—bullets ripple towards the robot in trademark Matrix fashion, a car explodes and flips over your head, and rubble flies through the air. It was the last category that got me: As rubble flew towards my face, I jerked backwards expecting to feel concrete hit me in the face. While "Presence" and this sense of realism is incredible, some of the other demos were just as impressive for entirely different reasons. One brief section had me standing over a neon orange map, beacons shining into the sky from the heart of each city. I could easily see playing a real-time or turn-based strategy game from this viewpoint—the art style made me think of DEFCON, but any God-view game would work. And finally, one demo I was merely floating in space next to a small model town, as if someone had built a model railroad and left it there for me. This scene was the best demonstration of Oculus's new audio focus, with sound fading in and out seamlessly as I leaned around the town. Positional audio isn't exactly a new idea, but it's amazing how much it can help improve the "reality" part of VR. 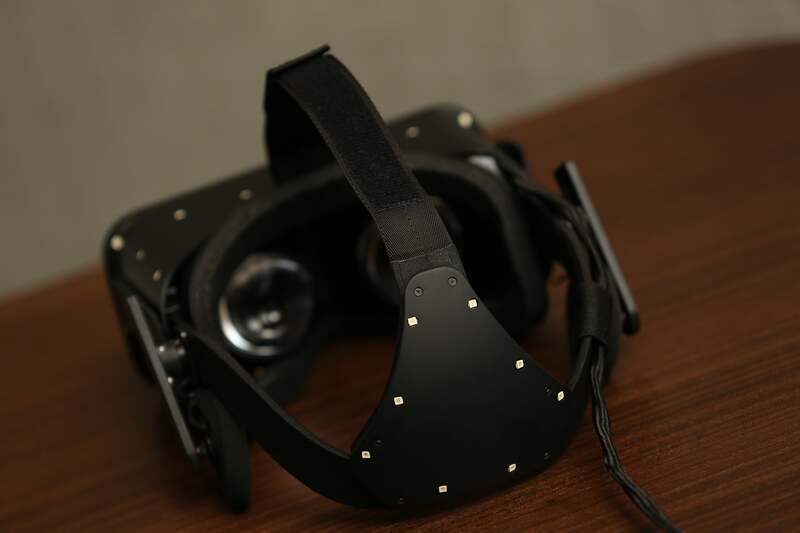 The Oculus Rift Crescent Bay prototype ads integrated headphones, which you can see in this picture. 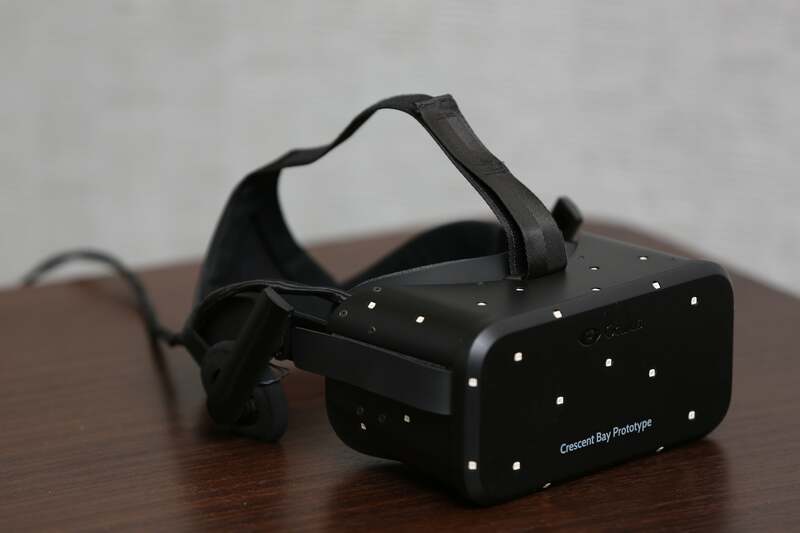 The biggest downside with Crescent Bay, and presumably the final consumer Rift model? That damn cord. Moving around the room with a cable attached to your head is an enormous distraction, and multiple times I got really into the scene only to be jarred out of it by a tugging feeling on the side of my head. Obviously it also makes spinning around in a circle a disaster. There's also the question of setting everything up. In the demo room, the positional camera was mounted on the wall. That's even less portable than the DK2's "mount this on top of your monitor" camera, and I'm curious whether standing is a use case Oculus is actually fully promoting or whether it was simply for demo purposes. As for the headphones, I'm currently ambivalent. I didn't get a great look at the headphones and the Oculus staffer in my room refused to answer any questions or let me see the unit closer, but they appear to swivel out of the way when you want to wear real headphones. In other words, I don't think they detach completely. The audio quality was fine for demo purposes, but that's about the most I can say—a crowded convention isn't the best place to test audio fidelity. It's impressive, though. To think that we've gone from DK1 to Crescent Bay in approximately two years...well, it's mind-blowing. 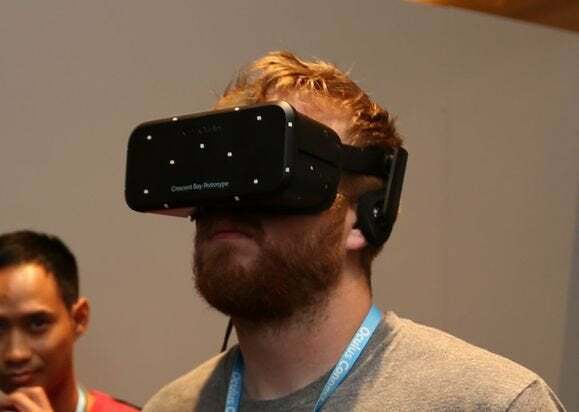 Still, the main problem for Oculus at this point is to release a product. Hopefully our current indications are correct and this is at long last the final step before a consumer rift release. Because they've already made me a believer. Hell, I was a believer after I used a DK1 for the first time. Now the only challenge is to get you to believe too.